Yes, that is a photo of my cat, Xander. 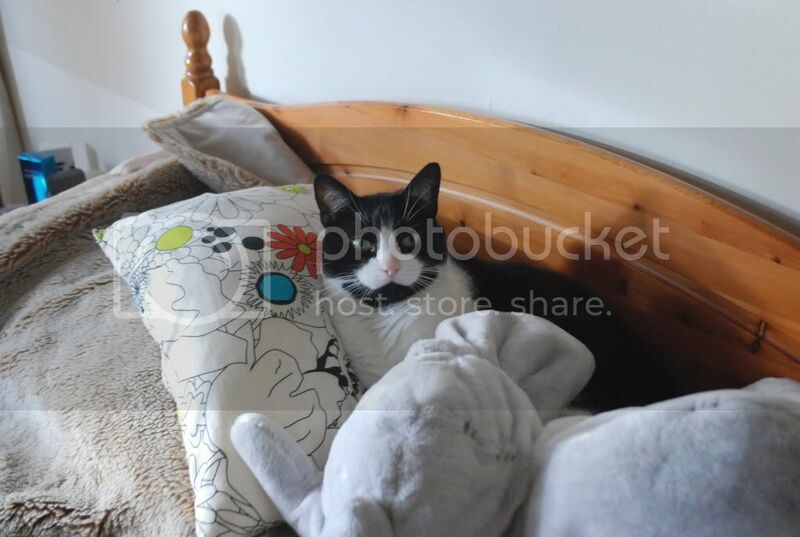 He's a cutie, all snuggled up on my parent's bed between a cushion and a stuffed elephant teddy. I don't care that he has no relevance to this post or my blog. He's my baby, and I miss him so. Plus I talk about him a lot on Twitter, but don't think I've ever introduced him on here? Had to sort that out. I just had to post a quick something-or-other about the fact Dani Johanna has had a bit of an overhaul, and therefore a new layout :) It may not look amazingly different to before, but I love it. I got sick and tired of the headers, link buttons etc that they all had to go. I wanted something nice and professional, but girly at the same time (hence the splashes of pink! I needed some pink in my life). I still think there is something missing, but what that is, I'm not sure. I might have to sleep on it.